Let's face it: your kitchen floor probably gets the most action of any of the flooring in your house. 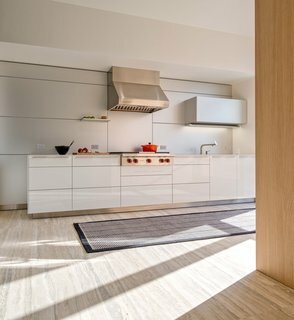 So making sure you have chosen the right materials is one of the most important decisions to make in any kitchen renovation. 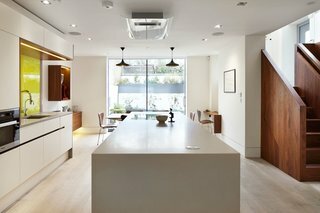 Often the center of the home, there's no doubt the kitchen is a heavily trafficked area. 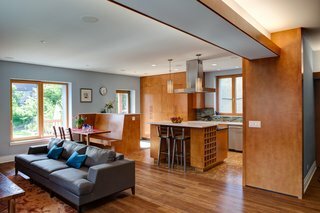 Serving as a social center where family and friends can gather together, the flooring in this area should be durable, functional, and long-lasting in order to withstand the test of time. 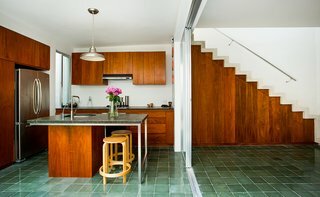 Below, we've narrowed down six of the best materials to consider when looking to renovate your kitchen floor. Understated and elegant, bamboo flooring is a great choice, as it is eco-friendly, durable, and aesthetically pleasing to the eye. Not only is it relatively affordable compared to hardwoods, but it is also low maintenance, as it doesn't require any special care. Plus, bamboo is springy underfoot, making it a more ergonomic choice than some harder options. However, it isn’t as moisture-resistant as other materials and can warp in high humidity, so make sure your home's climate will welcome this material if you decide to go with this option. 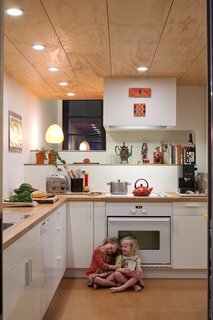 Above is an example of bamboo floors in a contemporary-styled Seattle kitchen. If you're seeking an option that is eco-friendly and durable, bamboo flooring is a great choice. Hardwood floors are a classic choice. A top contender for flooring throughout the home, wood flooring offers a high-end, warm look. By adjusting the stain of the wood, you can also change up vibes instantly. Although hardwood floors can be pricey, the use of reclaimed wood can be a more cost-effective and eco-friendly choice. However, because wood in kitchens require special protection from excess moisture, if you live in an area with high humidity, you may want to avoid wide planks, as they can warp over time. Above is an example of floors made of reclaimed eucalyptus. 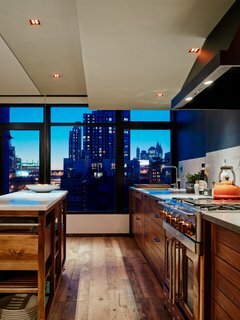 This formerly dark basement kitchen now feels much lighter, thanks to the addition of white oak floorboards, bright plaster walls, and floor-to-ceiling windows that let in garden views. A large kitchen island makes up for the lack of upper cabinet space and separates the kitchen from the living room. 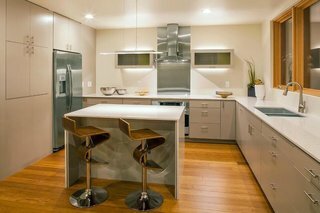 The cabinetry is custom made by Henrybuilt, hidding all appliances other than the copper BlueStar range. 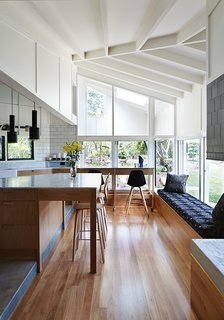 Above, the architects used blackbutt wood for the flooring and Whisper White paint by Dulux throughout the interior. An A110 Hand Grenade Pendant Lamp by Alvar Aalto for Artek hangs above the white Carrara marble-topped island. 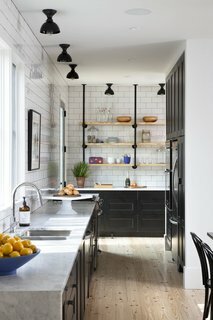 This space combines black cabinets, white subway tiles, marble countertops, and wooden floors to create a balance between rustic warmth and industrial simplicity. Durable and easy to clean, stone is an excellent flooring option with a great variety of choices. Marble, travertine, granite, and slate are popular options, which can add depth and a level of sophistication. Naturally cool, stone flooring is a good choice for hotter climates. Yet don't let that deter you if you live in cooler temperatures, as installing sub-floor radiant heat will keep your floors warm in the winter. Just be sure to purchase more than you need and review all tiles before installing them so you can pick your pieces to maintain a single tone. 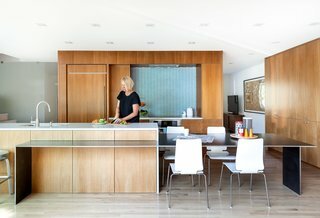 To transform a gaudy and green developer's special, Nanelda Priftaj, an in-house designer at Bulthaup Toronto, stuck to a sophisticated palette of light woods and stainless-steel appliances. "We chose materials that elevate the aesthetic timelessness and comfort of the space," she says. "Keeping this in mind, we chose several reflective surfaces to brighten the kitchen." The floors are heated Mare Argento travertine and the rug is from AGATHOM Co. 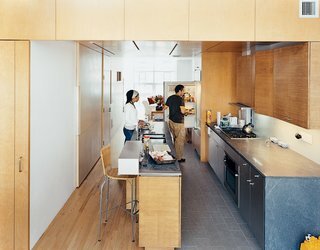 In this kitchen, the architects contrasted the oak floor, bamboo cabinetry, and birch walls with what architect Jonathan Knowles calls "a family of grays," meaning granite floor tiles, limestone countertops, and the steel stairway. 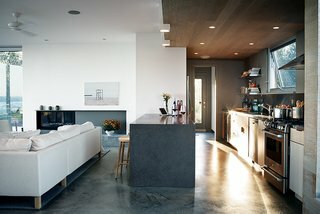 Above is a kitchen from IKEA created with Brazilian slate floors. Another classic flooring solution is tile. Tiles can work for any budget and come in a variety of colors, shapes, and sizes, not to mention they are also easy to clean. Tiles are a wonderful way to add character to your kitchen floor. Two examples are ceramic and porcelain—both being made from clay mixtures fired at high temperatures to create a hard, durable material. However, one drawback to tile flooring is that the individual tiles can crack, and grouting does require periodic sealing and cleaning. 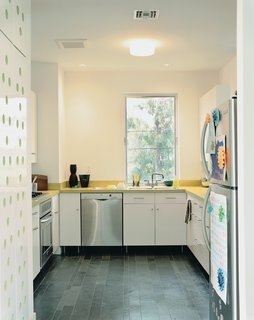 Handcrafted green cement tile floors are used in the kitchen and in many living spaces in the home. Honed granite counters, Tzalam wood cabinets, and GE Profile appliances complete the airy space above. 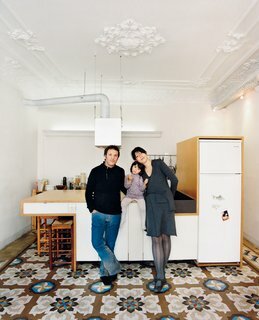 Homeowners Cecilia Tham and Yoel Karaso renovated their home in Barcelona, harmoniously overlapping elements of the old and the new. 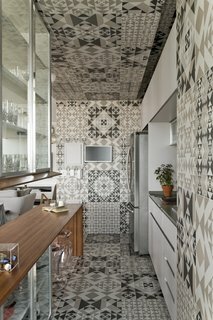 Above is an example of graphic tiles covering the floor, walls, and ceiling. 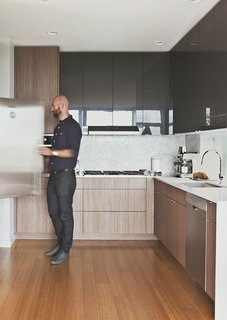 Polished concrete flooring is an easy way to obtain a stylish contemporary look and can make a great choice for a low-maintenance kitchen floor. 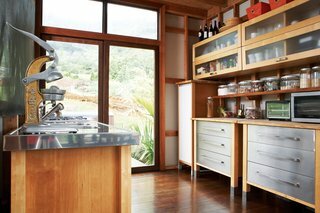 Durable enough to stand up to the busiest kitchens and easy to clean, concrete is a lovely choice for warm climates. However, concrete can be hard on your body if you will be standing for prolonged periods of time. 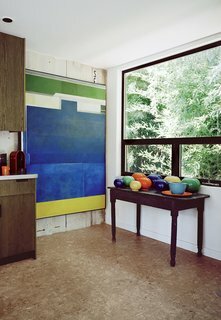 Don originally wanted to have wood floors throughout the interior but for cost reasons he decided to use lightweight concrete instead. "In order to make it as resilient to cracks as possible, the concrete is extra thick and has fiberglass and wire mesh reinforcing," he says. "It was polished and machine-troweled as it was being finished, the same as the lower-level concrete slab, so we could get a similar look throughout." The cabinets above are from Ikea, the range is by GE, and the Jenn-Air refrigerator is tucked unobtrusively into the pantry wall. The troweled concrete floor was poured in place by builder Peter Knudsen. 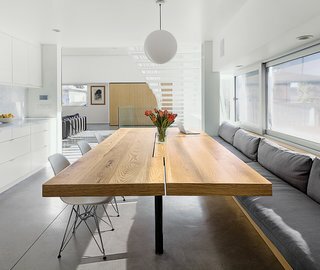 Concrete floors are not only affordable, but also versatile and trendy. The appliances above are by Frigidaire and the black countertops are sealed with Eco Tuff by Eco Procote. Eco-friendly and a natural insulator, cork is another great flooring choice. It is also naturally anti-microbial, and if you’re on a budget, cork tiles are easy to install yourself. However, make sure the cork you choose has a durable finish so that it can repel water. If you are purchasing cork tiles, it is advisable to buy extra in case you need replacements in the future. If you're looking to keep costs low, cork is extremely budget-friendly. 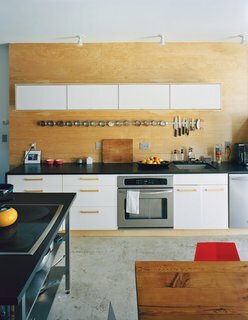 Above is an example of how inexpensive plywood line the ceiling and cork covers the floors. Cork can also be affixed to one another, rather than nailed into the floorboards, as shown above. This allows the tiles to expand and contract with heat, making it ideal for radiant surfaces. 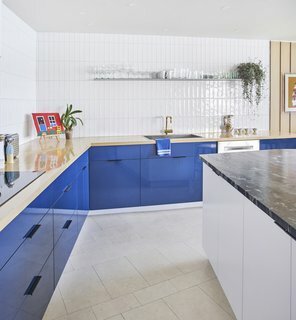 A wood countertop with blue laminate cabinets underneath contrasts with a white island topped with travertine. The wall tile is Origin Birch White by AKDO, and the brass faucet is by California Faucets. As in the rest of the apartment, the flooring is colored cork from Globus Cork. The room above features flooring with Teragren bamboo, cork in the kitchen, and porcelain tiles at the entry points. American Yellow Birch was used for the cabinets and trim.